Read the full interview in the latest issue of Official Xbox Magazine, out now! Ever since its reveal at the PC Gaming Show earlier this year, Sable has captured the hearts and minds of indie gamers everywhere, with its abstract, unforgettable art design and experimental electro-pop soundtrack set to a lonesome, meditative exploration experience. Sable is the debut game from Shedworks, a development studio made up of Daniel Fineberg and Gregorios Kythreotis who, true to the company name, are literally working from the comfort of a North London shed in Kythreotis's garden. Official Xbox Magazine recently travelled to said shed to chat with Fineberg and Kythreotis about all things Sable, including its inspirations, development, and fascinating design philosophy. You can read the full interview in issue 171 of OXM, which is out on store shelves today (why not subscribe to have each copy delivered to your door? ), but fans of Star Wars may be interested in a small snippet from the conversation, in which Kythreotis reveals the initial inspiration for Sable's setting and story. "It came while watching Star Wars: The Force Awakens, actually." he explains. "When Rey is on Jakku. The idea was, what if she never left? I initially thought of the game as an isometric clicker game where you’re just looting old fallen things and you come back and you sell what you loot and that was it. But then I thought, what if this was a fully 3D thing and you’re driving directly between these locations rather than it just being a cutscene, and it just spawned from that." But Star Wars isn't the only thing on Shedworks' mind. 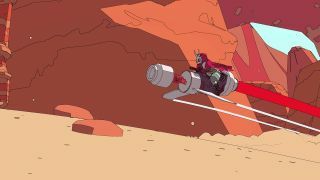 The duo also discuss Sable's intentionally lowered framerate, their advice for up and budding indie developers, and the unexpected benefits of working from that titular shed. The game is due to release on Xbox One and PC sometime in 2019, and we're already prepping our tissue boxes for the transcendental experience it promises to be. To read the full interview with Shedworks, pick up the new issue of Official Xbox Magazine in stores from today, or subscribe so you never miss an issue.